Welcome to the official PastorPaul.net app. 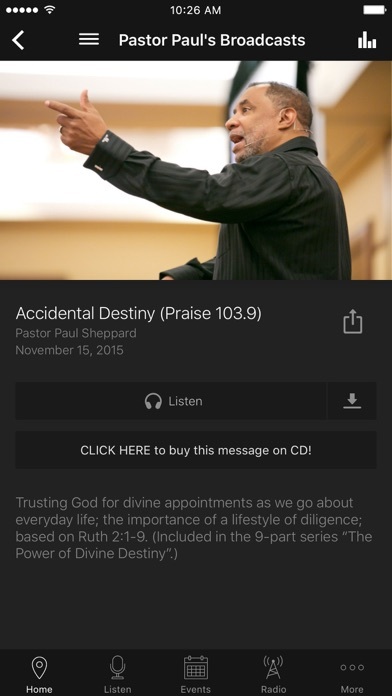 This app features powerful content from Pastor Paul Sheppard designed to strengthen and encourage you in your walk with God. 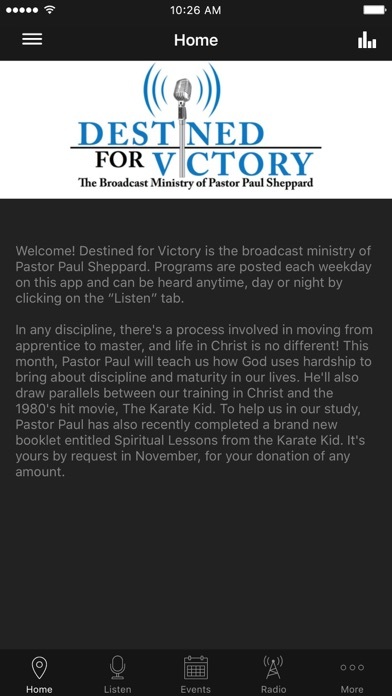 Features include: *Free podcasts of Pastor Paul's recently aired sermons *Destined for Victory radio broadcast info *Store complete with CDs, DVDs, and books from Pastor Paul *Easy online giving *Pastor Paul's speaking engagements *E-Newsletter sign-up *Social media/contact info The PastorPaul.net app was developed with the Subsplash App Platform. I really can’t remember how I discovered Pastor Paul but I can tell you I absolutely love his ministry and his sense of humor. I listen every single day. I am so thankful that this app is finally here!! Now I don't have to worry about going into the podcast in missing some! Thank you for always downloading the daily word and for downloading it early as I go to work early and can listen to it on my way! The last couple of downloads for the 24th and, today, the 25th are not working, however. So I just wanted to let someone know, and didn't know how else to do it. Hopefully it's fixed soon! Thank you for all that you do! Happy Thanksgiving!! Super excited about this and looking forward to hearing and sharing the Word.